Born in 1925 in La Mesa, California, Brother Martin grew up during the Depression. His family got by as best they could, but times were hard. When he was 11, his family moved to San Diego, where Brother Martin was very involved with his local parish. “In a peasant Mexican family, religion is part of your life,” he says. A Knights of Columbus scholarship allowed him to spend his junior and senior years at a private, Catholic high school. After graduation, he went to work at an aircraft plant. In 1943, at age 18, Brother Martin was drafted. Following basic training, he was assigned to the 1st Cavalry Division. He served in numerous campaigns in the Pacific Ocean theater, earning a Silver Star for his bravery during the Battle of Los Negros in the Admiralty Islands. Later, in November of 1944, his unit ran into trouble fighting in the mountains of Leyte, an island in the Philippines. “My troop was pinned down in a ridge we nicknamed “Starvation Ridge” because no food or supplies could get through,” says Brother Martin. 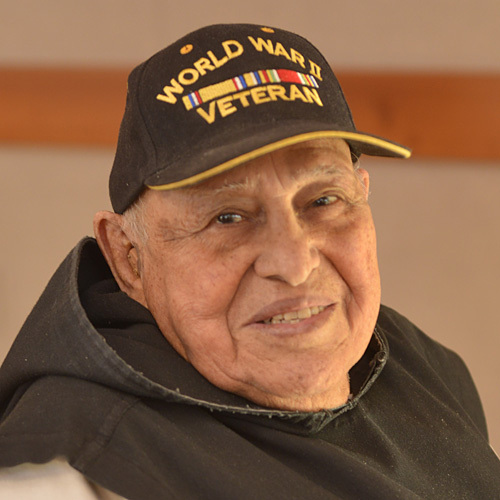 After fighting in the Philippines, his unit began training for what was thought would be the final battle of the Pacific, the invasion of Japan. Brother Martin was assigned to carry a flame thrower and scheduled to be among the first wave of soldiers to invade the mainland. Sixty percent of those in the first assault were expected to die. Shortly before the scheduled attack came news that Japan had surrendered. After returning from the war, he spent several years trying to find his path. “I did some hard searching,” Brother Martin says. He worked various jobs and attended a semester of college. He dated. “Coming back after the war was a struggle. There was always this attraction to religious life, but I thought you had to be a saint or an angel. Brother Martin entered Our Lady of Guadalupe Abbey, which was then located in New Mexico, on May 29, 1952. “Being Mexican, you’ve got Our Lady of Guadalupe in your blood,” he says. In 1955, the community moved to Carlton, Oregon, and Brother Martin was among the founding members to establish the current abbey. The early years of solitude were a struggle for him. “In those days, the monastery was very strong on silence,” he explains. “I was in charge of the chicken house. I spent hours talking to the chickens!” Over the years, Brother Martin has served his community in a variety of capacities, but his primary work has been in the guest house, where he continues on a part-time basis today. “I’ve always had a talking job,” he laughs.